Few today remember the Mary Rebekah Lodge, the female version of the Pilgrim Lodge of Odd Fellows. A sorority of community-minded women. 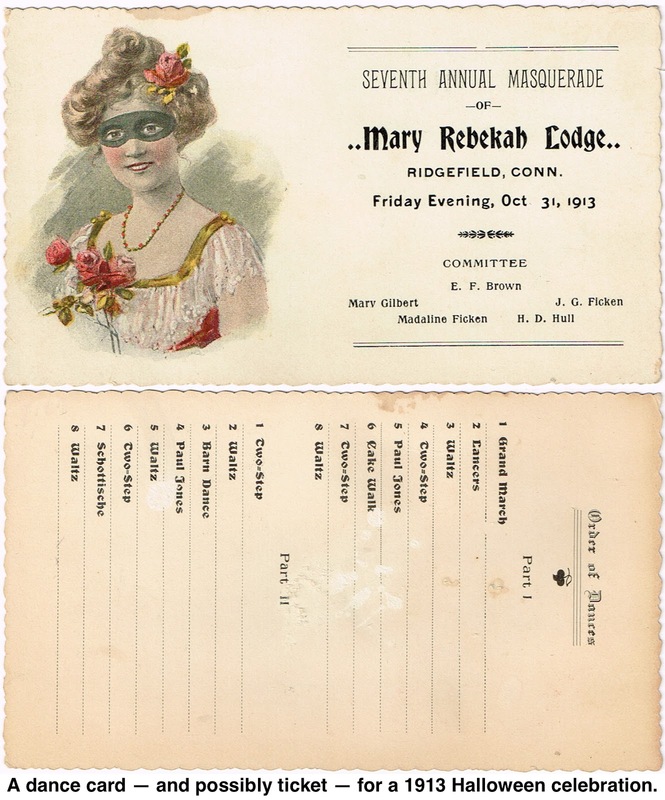 the Rebekahs sponsored special events like card parties, plays and rummage sales to raise money for local organizations, such as the Red Cross and Girl Scouts, as well as old folks homes for their own members. Mary Rebekah Lodge was established here in 1905 as Rebekah Lodge No. 51, but since so many of the members were named Mary, they decided to personalize the lodge’s name. Although they had many social events throughout the year, the Halloween Masquerade was the big annual shindig for the Rebekahs. What’s interesting about this piece of ephemera, which may have been an admission ticket, is that it includes an old-fashioned dance card on the back. There, partners could sign up to dance with a fair damsel, in this case, by the type of dance available. How many know what a “lancers” or a “Paul Jones” is? Or a “schottische” for that matter. It’d be tough to find a place to dance those today — except maybe the lancers. The Rebekah masquerades took place in the Masonic Hall, still standing just south of the town hall, until the 1920s when the Odd Fellows built their own hall on Main Street — now occupied by the Toy Chest. In 1956 they sold that place and moved to an old carriage house on King Lane. The Rebekahs disappeared in Ridgefield about 25 years ago because of dwindling membership. The Odd Fellows, founded here in 1847, lasted till about 2006 when they sold Pilgrim Hall on King Lane to the Methodist Church, which has turned part of the building into a chapel.